Extra Specifications: See video of features below! 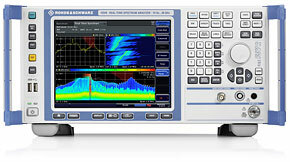 The Rohde and Schwarz FSVR combines a full-featured signal and spectrum analyzer with a real-time spectrum analyzer. In real-time operation, the R&S FSVR seamlessly measures and displays the spectrum in the time domain with a span of up to 40 MHz. As a result, it captures every event for analysis, no matter how brief that event might be. Check out the great video of FSVR features below! BRL Test customers enjoy real savings on premium quality used FSVR's while resting easy with a full 1 year warranty and lifetime support promise that is backed by of our world class repair lab.